The fellow that can only see a week ahead is always the popular fellow, for he is looking with the crowd. But the one that can see years ahead, he has a telescope but he can't make anybody believe he has it. Will Rogers, The Autobiography of Will Rogers, 1949. Below are compared 2-yr Berg Timer and yearly Dow average percent change since 1960 with forecast through 2025. The Berg Timer forecast above was first published here in 2002 but we all know BT goes infinitely back and forward without loss of reliability. BT peaks here in 2018 as forecasted infinitely ago by BT (here in 2002). Time now to take some profits. Expect a down 2019 but then a good 2020-21. I have to repeat here what was written in the 2015 piece below, "The next President after Obama will take credit for a strong 2018 but a retraction in 2019 will come. 2020 and 2021 look great, possibly give the president another term if it happens early enough in 2020." That forecast was so good I must have cheated! But it's not me folks, it's all BT. Yes, Trump taking credit for the 2018 economy. But I wish he would give BT at least some credit. There's great correlation here. You can see how BT forecasted the market doldrums of 1962, 1974, 1988, 2001, 2008 and the hot market periods of 1964, 1972, 1983, 1995, 2004, and 2010. See how it hit the peak in 2010 as forecasted. BT now declines and stays low for FOUR years. Remember the statement here, published three years ago, stating, "Beware of false optimism in 2010, a double-dip recession is very probable.". The media, finally, talked about a double-dip recession in June 2011, but here, on this website, BT forecasted a double-dip recession three years ago. The decline of the Dow average in 2011/12 was properly forecasted here and can be seen in the chart above. The economy doesn't recover until 2015, so don't expect sustained market strength until then. As forecasted last time in above 2012, economic recovery is now being seen in 2015. However, this is not strong. The above forecast based on the 2 year Berg Timer shows that the economy is displaying a "false" recovery in 2015, with a sluggish economy after that until 2017. The next President after Obama will take credit for a strong 2018 but a retraction in 2019 will come. 2020 and 2021 look great, possibly give the president another term if it happens early enough in 2020. A slow economy in 2022 to 2025 due to the forecasted major drought during that time. 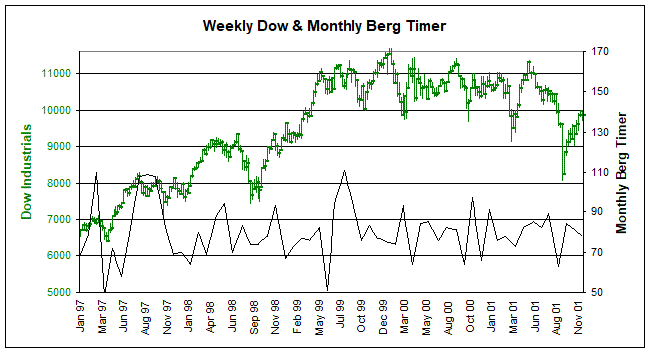 Above are compared the weekly Dow Industrials to the Monthly Berg Timer. Strong BT consistently marks market peaks and low BT marks market bottoms. Below are compared Sky Cover (in tenths) average for each month in Omaha from 1970-1991 ('78-'85 not available) and the S&P 500 average percent gain/loss each month from 1951 to 1977. 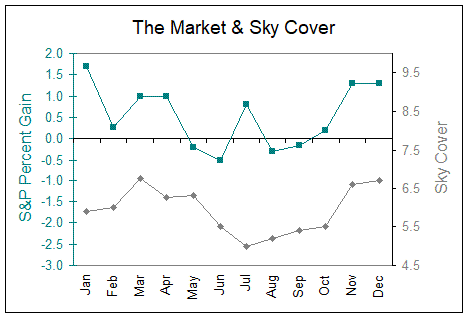 Sky Cover is seasonal and so are stocks. High Cloudiness = Peaking Market (March, April, November and December). Low Cloudiness = Bottoming Market (June through October). "Psychological evidence and casual intuition predict that sunny weather is associated with upbeat mood. This paper examines the relation between whether a day is sunny and stock returns that day at 26 stock exchanges internationally from 1982-97. We find that sunshine is highly significantly correlated with daily stock returns." Good Day Sunshine---Stock Returns and the Weather, David Hirshleifer and Tyler Shumway, August 17, 2001. "Our analysis reveals that lower temperatures are indeed related to higher stock returns, and higher temperatures are related to lower stock returns. The relationship is significant both statistically and economically when the temperature is low, and is robust to various alternative tests." "By examining nine market indices for eight international markets, we have indeed uncovered a temperature anomaly. Our analyses reveal a statistically significant relation between the temperature and stock market returns: the lower the temperature, the higher the stock returns, and vice versa. The relationship is much stronger when the temperature is low. Our results are also robust to alternative definitions of temperature variables and controlling for such known anomalies as the Monday effect, the tax loss effect, the cloud cover effect, and the seasonal affective disorder effect. Thus, our empirical evidence supports the hypothesis regarding lower temperatures vis-`a-vis higher stock returns, and reveals that apathy dominates aggression when the temperature is high, which results in lower stock returns." Stock Market Returns---A Weather Anomaly, August 2002, Cao & Wei. 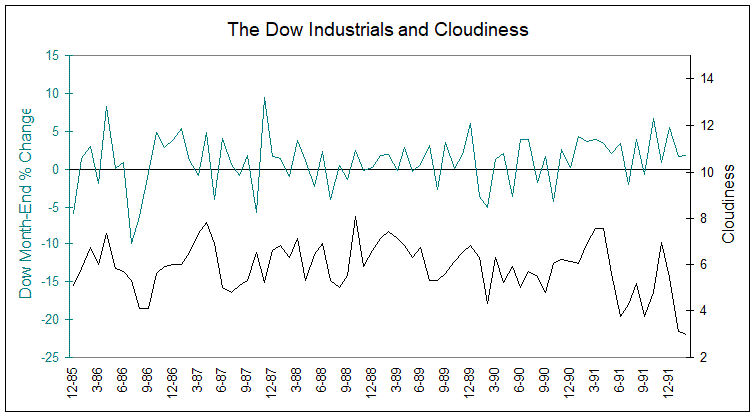 Above are compared the monthly Dow % gain/loss and monthly cloudiness in Omaha from 1990 through 1996. Again, when skies are the most overcast, the market peaks and turns down. When skies are the most sunny, the market bottoms and turns up. Evidently mass psychology, as reflected here in stock market prices, is affected by meteorological and/or atmospheric conditions. Omaha is a good location for this study since Omaha feels the effects of all the weather systems which move out of the Rockies toward the east. Below are compared the S&P500 monthly average and barometric pressure in Omaha. The stock market makes major peaks and bottoms with barometric pressure peaks and bottoms. If one had simply bought and sold at the bottom and top lines in pressure one would have been out at the major top in the Spring 1969, in on the major bottom in Mid-1970, out at the major peak in early 1973, and back in at the major bottom in late 1974. Again, mass psychology, as reflected in stock prices, is apparently affected by meteorological conditions. This barometric pressure indicator was made by determining the monthly departure-from-normal pressure in Omaha Nebraska. Omaha is a good location for detecting these relationships. It catches all the weather fronts that coming out of the Rockies.